- Culver's Night, 5-8 p.m.
- Chipotle Restaurant Night in PV, 4-8 p.m. Happy Labor Day! Fall Fest is this Friday, September 7, come out and join in on the fun. 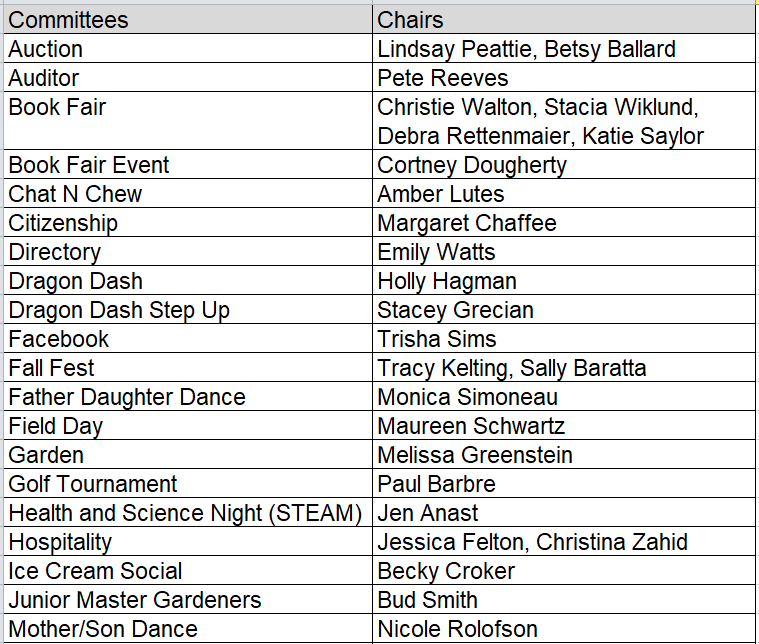 Thank you to everyone that is volunteering at Fall Fest....we filled all of the slots! Turn in your Fall Cake Decorating entries AND goodies for the Cake Walk by Friday morning. Culver's Restaurant Night is coming up on Tuesday, September 11. More details are outlined below. Please join us that evening to support Corinth. Parent Parties are coming up in September and October. Be sure to mark your calendars and visit the online directory to make your donation. The Parent Parties are always a great time! Please join us for the first Restaurant Night of the school year on Tuesday, Sept. 11th at Culver's! 10% of ALL sales (dine in or drive thru) from 5-8pm will be donated to the Corinth PTA - no flier is necessary so please spread the word to your non-Corinth family and friends as well. Extra, fun incentives with Culver's include having Corinth staff help deliver meals, AND the grade with the most attendance will receive a free coupon for custard (so be sure to sign in). Hope to see you there! It’s time to start turning in those the Box Tops for Education! This is a super easy way to help the Corinth Community. Simply look for the Box Tops for Education coupon on the products you use, clip it, and put it in a ziploc bag. Send the bag to the Corinth Office with the name of your child, grade, and teacher. The class with the highest participation by October 26th wins an extra recess from Mr. Lowe. Also, all students who bring in any number of Box Tops will be entered for a drawing for a $5 Target gift card. We will select one student per grade. Box Tops is also a great way that grandparents and other family members can support our kids, so be sure to ask others if they can help, too. If you miss turning in your Box Tops by the October 26th deadline, do not worry! We will count any late arrivals toward the spring drive. If you have questions, feel free to contact Jill Fraley at jillfraley@gmail.com. Join us at our annual fun family fall fest event. Friday, September 7, 5:30-8:00 p.m.
Don’t forget to join us, Friday, September 7 th from 5:30-8:00pm for food, fun and friends. Haven’t bought your tickets yet? No problem, we will sell them at the door: $20/kid, $45 for 3 or more. Adults don’t need a wristband. Cash, check or card. The Mad Greek Traveling Taverna food truck will be on hand. Gyro & Fries or Falafel & Fries for only $8.50. Kids Chicken Strips & Fries for $5. The Sweet Shoppe will be open for kids with wristbands so make sure they visit and collect their free donut. We will have plenty of water coolers and cups on site all around the school, along with the water fountains, but you are encouraged to bring your own water bottles. In an effort to be more environmentally friendly we will not have bottled water this year. be determined by the student body. Cake Decorators need to have their most festive Fall Cake entry submitted to the front office before school on Friday, September 7. Prizes will be awarded to the 1st , 2nd and 3rd place cakes. All cakes need be picked up after school. Any cakes remaining in the office after school will be donated to the Cake Walk. All families please bring a small cake, cupcakes or cookies for the cake walk. Cupcakes and cookies should be packaged in groups of 6. Donations should be brought to the office by the morning of Sep 7. Thank you Dragons! We’re looking forward to another amazing Fall Festival. If you have any questions, please email Tracy Kelting or Sally Baratta. What is a better item to bid on then one that has been created by your own kiddo?!? Classroom treasures are an auction favorite and become an item to look at for years to come that reminds you of that specific year in your child's life. They can be one item that the entire class contributes to (think of a single painting that they all help paint) or individual items that are bid on separately (think of a cute/unique photo of your kiddo). So many of you have signed up to lead this charge - THANK YOU - but we are still in need of someone to head this effort in a few classes. If your kiddo is in Avery, Townsend, Monteil, Biller, Boeschen, Leaders or Pierson and you are interested in helping, contact Maggie Wasserman. This is super easy and just needs one person to lead the charge and make it happen - and the good news is – we have a Pintrest board with tons of ideas to pick from AND Mrs. Bogart LOVES to help with these – so you are not alone in this! Ideas are due soon - so don't delay and sign up today! Calling all 5th and 6th graders! Now is your chance to sign up for “Youth In Action” - a Corinth community service group performing monthly service activities to make our community a better place! Please see the attached form for additional details and to sign up for this great opportunity. Please note that the t-shirts are the same as last year so any 6th graders that are returning to YIA and have a shirt that fits (and know where it is!) won’t need to order a new one. As we start off the new school year, please take a moment to pay your PTA dues for the year. Dues can be paid by check with the attached form or online with your credit card or PayPal through the Corinth directory under the PTA tab. Dues are $10 per adult. By joining the Corinth PTA, you are also joining Kansas PTA and National PTA, and aligning yourself with the largest children’s advocacy group in the country. PTA membership will provide you with full access to the Corinth directory. Please remember to update your student’s teacher information when you pay your dues. Remember to update your student’s listing in the online directory! Please do not make a duplicate entry. Your information from last year will be in there. If you have forgotten your username or password information, there is a new reset feature. Text RESET to 913.380.1465 and you will be able to reset your login credentials. New Corinth families go to the directory website and choose Add Listing from the menu at the top of the screen. Enter all of your information and hit the Update Directory Button when you are finished. To put the directory app on your phone - open the directory website on your phone and it will give you the option of putting the directory icon on your home screen. This is a very handy. 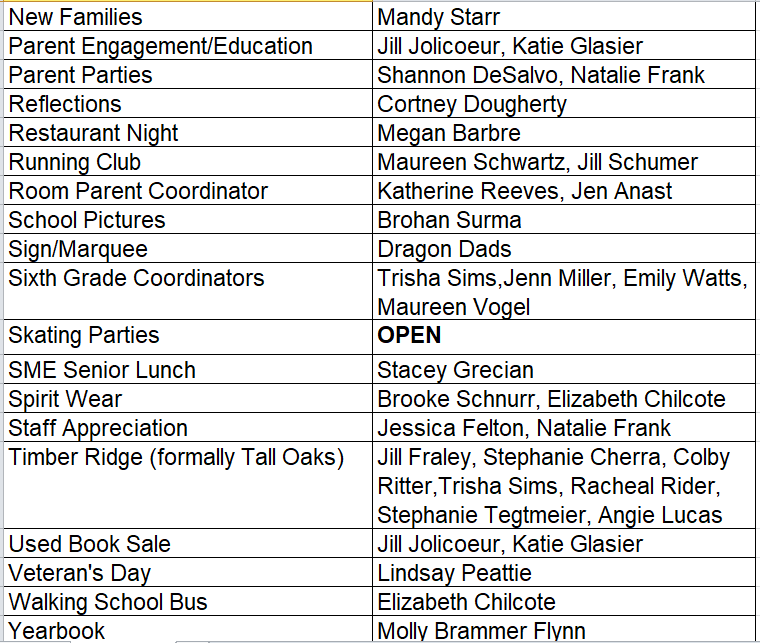 Once you have paid your PTA dues for the year you will have full access to the directory. Donate to support our PTA including our Social Worker, Math Specialist, field trips, Maker’s Space and more! A donation of $125 per child is suggested. Donations of all sizes are sincerely appreciated! Watch for an Invitation & Donation Envelope two weeks prior to the party. Checks should be made out to Corinth PTA or you can pay online through the directory. These are casual, adult only events to reconnect with old friends, and to meet new ones! Many thanks to this year’s party hosts! All parties are from 7:30 - 11p.m. unless otherwise noted. Are you new to the Corinth Elementary community? Do you need help figuring out what a Dragon Dad is or how to navigate the car line? It isn't always easy learning the acronyms used at a new school or where you can turn to for information. We've tried to make it easier for our new families by giving you a contact. Mandy Starr will help answer your questions or point you in the right direction when she can't. Want to stay connected? Follow the school and PTA on Social Media. We're still looking to fill two chair positions. We need a chair to coordinate the Talent Show. If interested, please contact Leanne Beezley. If we don't find chairs soon, the Talent Show may not be able to happen. Please help out if you can! !